Adam has had Chapel Hill on her mind for a very long time. In fact, Nicole began playing golf at age four. 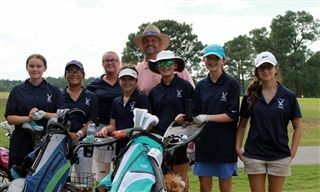 Nicole played in her first tournament as an eight year old and qualified for the US Kids Golf World Championships a year later. Her early exploits led her family to move to North Carolina from Ohio. As she progressed through the junior golf system, Nicole’s work ethic has been the driving force behind her successes. 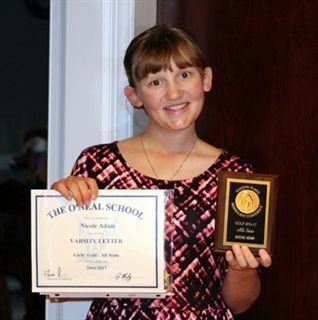 Nicole devotes endless hours to practice and her dedication is a compliment to her natural talent. Nicole sacrifices study hall times for strength and conditioning sessions while maintaining straight A’s in the classroom. Nicole is also is known to drag her family out to practice and playing sessions in all types of inclement weather, practicing for close to 20 hours a week no matter what the conditions. 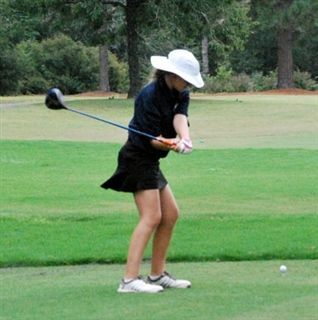 Nicole has worked her way up to the #1 ranking in her graduating class on the North Carolina Junior Golf Scoreboard. She also earned national recognition with a 3rd place finish at last year’s The Masters, Drive Chip, and Putt contest. Nicole is the daughter of Jeff and Dawn Adam, lives in Pinehurst and is a member of Pinehurst Country Club. Nicole plans to major in a healthcare associated discipline at the University of North Carolina Chapel Hill as a member of the golf team. Nicole Adam at the tee during a conference tournament against St. David’s School at Long Leaf Golf and Country Club. Nicole Adam showing her Varsity Letter received from O’Neal this fall and her NCISAA All State Plaque for Varsity Girls Golf.